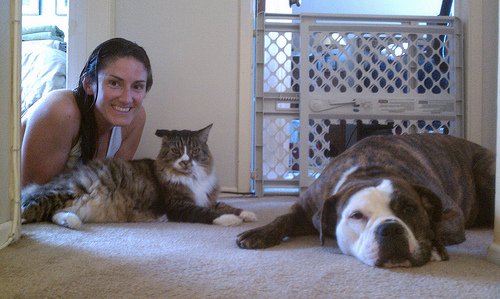 Me with our bulldog Agnes and our cat Tucker circa 2012 (RIP Tucker) in Culver City. Hi! Welcome to Wine + Quill and thanks for stopping by. 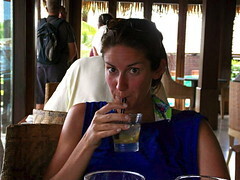 In addition to being a part-time blogger, I am a full-time daughter, sister, wife, new mom, friend and Wahoo (CLAS ’01). A customer once told me, as I was waiting on his table at La Playa Hotel in Carmel, Calif., “You have the elegance and sophistication of an east coast girl, but the energy of a west coast girl.” Those words have always stuck with me, and I’d like to believe the man’s kind words are somewhat true. Though I learned to swim before I could write, I eventually picked up fountain pens and blank books in elementary school, and have been keeping journals ever since. Several of them are stowed away in various desk drawers, some in California, some in Connecticut. It wasn’t until I read about Stephanie Klein’s blog “Greek Tragedy” in 2005 that I decided to ditch the books for an online diary. Some prefer to keep their lives private, while some are an open blog. And so Mona’s Apple was born. Seven years ago I met the love of my life, MainMan, who is now my husband. We met at Warrior’s wedding in Aspen in 2009. He is a Connecticut native who had moved to Los Angeles a few months prior. We dated long-distance for a year before I drove from one coast to the other with my mom. I maintained (though quite shoddily) the Apple, renaming it “Mona’s Apple… Goes Hollywood,” but it had been in long need of a revamp/some closure. Enter Wine + Quill. Following my person (MainMan) and family and friends, of course, there are few things in life I love as much as a good glass of wine. Whether it’s a Justin cab or a Trader Joe’s special strictly meant for happy hour sippage (L’Authentique, anyone? ), wine is always around me. It warms my head and my heart, and I hope to have a similar effect on people here. Recently we uprooted from Southern California for MainMan’s job and we landed in South Carolina. There my husband worked at the local zoo for two and a half years and we have since returned to California. I’m Lisa and I’m an avid reader and blogger, a passion which I think we share. Your blog “wineandquill.com” is by far the most interesting I have come across in the recent past, hands down! The writer in me is yearning to write a piece for your blog, maybe around 400-500 words, or anything that you are okay with.If this is something you could allow me to do, may I as well add a single link to our site?